It’s always the heart that counts, not the size. The drive. The will to succeed. The spunky little Jeeps that first rolled into combat in World War Two may have been on the small side, but they packed a punch, helping the Allies roll to victory. That small-but-mighty heritage lives on in the 2019 Jeep Renegade. While it may be the smallest member of the Jeep family of vehicles, it makes up for its smaller size with great styling, surprising performance, and legendary Jeep capability. Are you looking to buy a 2019 Jeep Renegade in Rogers, Arkansas? Then stop in today at McLarty Daniel Chrysler Dodge Jeep Ram Fiat of Springdale, where our selection, prices and service after the sale will make you a customer for life! TOUGH, PURPOSEFUL DESIGN: Jeep has long been a brand defined by styling that is instantly recognizable as a Jeep. While the 2019 Jeep Renegade has the short and nimble design prefered by today’s modern drivers, features like the seven-slot grille, round headlights, trapezoidal wheel arches and tough and rugged stance make sure there’s no mistaking it for anything other than a Jeep. Available in several beautiful colors — including the eye-catching wraparound black roof for a two-tone look — the 2019 Jeep Renegade is available with your choice of seven alloy wheel styles, in diameters from 16- to 18-inches. Want to let Mother Nature ride shotgun? Check out the available My Sky removable panel sunroof, or the CommandView Dual-Pane Panoramic Sunroof, for a tanning booth experience on wheels. LEGENDARY CAPABILITY: Jeep has always been a brand that doesn’t back down from a challenge, and that heritage of toughness and capability continues with the 2019 Jeep Renegade. Heading off-road in search of adventure? The check out the 2019 Jeep Renegade Trailhawk, kitted out with a special gray grille surround, red frame-mounted tow hooks, 17-inch alloy wheels with aggressive all-terrain tires, and shortened front and rear fascia to let you climb up and over obstacles that might stop any other SUV. Advanced door and electrical sealing mean you can ford water up to 19 inches deep, while 8.7 inches of ground clearance and hardened steel skid plates protect vital components. In addition to the Selec-Terrain Traction Management System, choose from Jeep Active Drive and Active Drive Low 4×4 systems, with a 20:1 crawl ratio for surefooted traction no matter what nature throws your way. 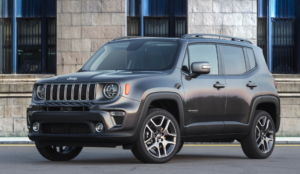 CUTTING EDGE PERFORMANCE: Jeep performance is legendary, and the 2019 Jeep Renegade is no slouch in that department, either, with your choice of two innovative engines. Standard power is the 2.4-liter Tigershark MultiAir 2 four cylinder, with 180 horsepower and 175 lb.-ft. of torque, while maintaining up to 30 miles per gallon fuel economy on the highway. Need more grunt? Then check out the turbocharged 1.4-liter MultiAir four, with 184 lb.-ft. of torque, 160 horsepower, and up to 31 mpg on the highway. Both engines are backed by the available nine-speed automatic transmission, to help both the turbo and naturally aspirated engine stay in the torque and horsepower “sweet spot” longer, for up to 2,000 pounds of towing power when properly equipped. There is only one Jeep, and there is only one 2019 Jeep Renegade: the compact crossover SUV that’s equally ready to hit the trails or take on the asphalt jungle, while keeping operating costs low for more fun-money in your pocket. Are you ready to buy a 2019 Jeep Renegade in Rogers? 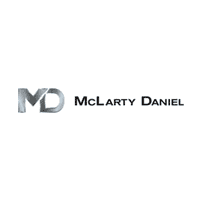 Then stop by today at McLarty Daniel CDJRF in Springdale. We’ve got a great selection of Jeep Renegade models, and our customer-focused deals and service after the sale will make you a customer for life. Come see us soon, or check out of big selection of Jeep Renegade models online right now!